Villa Corinne is a beautiful vacation rental. It boasts 3-bedroom, 3 1//2 baths (can also be rented as a 2-bedroom) where you will relax and rejuvenate in a 5-star setting with every desirable amenity at your fingertips. Two master suites face the ocean and the third faces the garden. All have European topped mattresses dressed in the finest linens. There is a gourmet kitchen to please the most demanding Chef and the villa is furnished in the finest designer fashion. 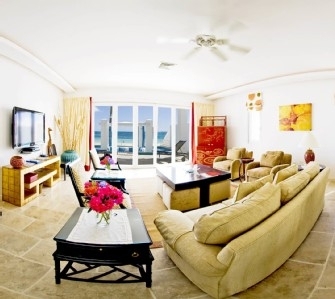 Over 5000 square feet of a luxury caribbean vacation villa is yours to enjoy. Beautiful ocean views from Villa bring instant serenity. 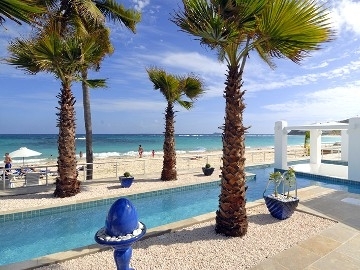 Dawn Beach is steps from your door and your own private pool awaits a plunge. When your day on the beach is done, bathe in the fabulous stone/glass showers with rain heads. Make a cool drink and watch the sunset from the cushioned and comfortable sunken gazebo. For dinner, walk a few feet down the beach and dine at Daniels surrounded by the sound of the surf. 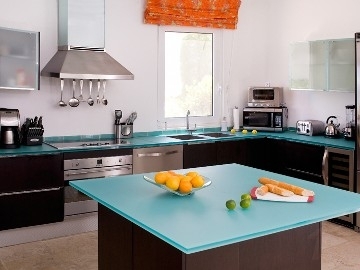 Or if you prefer, prepare something in the fully-equipped Chef's kitchen. Watch television or a movie on the 52" flat-screen TV from plush comfortable sofas and club chairs or enjoy your favorite music on the Bose sound system. When sleep catches up with you, sink into the European-pillow top king size beds with 800-thread count Egyptian cotton sheets and have the best night's sleep you've ever experienced. When you awake refreshed and ready for the day, take a walk on the beach and breathe in the pure Caribbean salt air. Then return to the Villa, perk your coffee beans in our Cuisinart Grind and Brew or use our espresso machine. Or if you prefer, you can head down the beach to Mr. Busby's where you can enjoy a full breakfast. He also serves a casual but varied luncheon menu including the best pizza I've ever had. Hang out and read your book on the terrace listening to the surf and enjoying the most beautiful views imaginable. Need some exercise - use the snorkeling equipment available in the Villa for your enjoyment or do some laps in the pool. 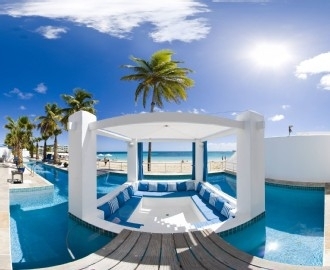 If you wish to take a day trip to Anguilla or St. Barts, the Concierge will arrange. Come dinner time, you have many options within a minute's walk from the villa - Big Fish, Daniels and Canoa are all excellent and provide fine dining with lovely settings. If fine French dining is your desire, Grand Case is 20 minutes away by car and boasts a dozen of the best restaurants on the water in St. Maarten. Le Tastevin is our favorite, but all are excellent. The Concierge can make reservations for dinner, a car, a boat trip or other activities you request. Also, a private Chef is available for your convenience with ample advance notice. If you want to stock the Villa with food and drinks, our Concierge can arrange this prior to your arrival. For nearby entertainment, there are some quality nightclubs and casinos within a short distance and the Westin Hotel is only a 2 minute ride by car where you can enjoy gambling and dining. Their Aura Stea House gets good reviews. They do a fun Happy Hour and a great Sunday Brunch. Phillipsburg is 15 minutes by car and has fantastic shopping for everything from fine jewelry to electronics as well as large selections of linens. Take a break from your shopping and have lunch at the Holland House on Main Street watching the harbor yachts. Be our guest for your next caribbean island vacation. If you love spectacular views, want to be right on the beach but demand ultimate comfort with fine living, Villa Corinne is the ultimate Prime Luxury Home on Dawn Beach. Believe me, it has it all! Email or call me today. 5% govt tax and 5% service fee in addition to prices noted above. etc. Also there is a fourth outdoor shower. groceries/beverages can be delivered to home. Full office set up with all necessary accessories. Maid takes care of all laundry everyday. Beautifully decorated with comfort and elegance in mind..